This holiday, NVIDIA GeForce©* and Star Wars™: The Old Republic™ join forces to offer you the chance to step into the center of your own Star Wars™ story with the ‘Rule the Galaxy Story Pack’ code! 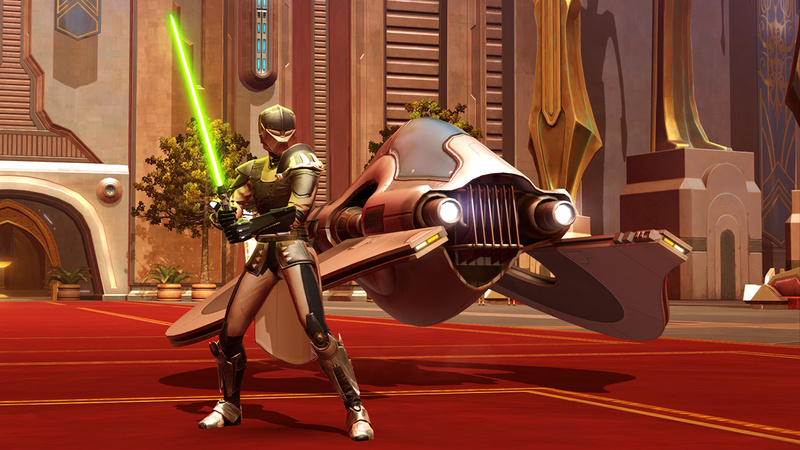 * Get full access to the epic Knights of the Eternal Throne expansion story, new Chiss Airspeeder and Force Veteran’s Armor Set – offer ends December 13, 2017! Full Access to Knights of the Eternal Throne expansion story, where you will lead the fight to rule the galaxy as a light side hero or dark side villain! This includes access to all 9 thrilling chapters of Knights of the Eternal Throne where you fight to take command of the galaxy as your enemies rise up to challenge your rule. Outlander Character Token, so you can start the adventure as a Level 65 Outlander in the Old Republic universe. Chiss Talon Interceptor Airspeeder, designed and constructed by the secretive Chiss Ascendency. Used to patrol and protect their worlds from outsiders, only a handful of these sophisticated craft have ever made it out of Chiss territory, making them highly sought-after among collectors and rival military forces alike. Force Veteran’s Armor Set, to set yourself apart as you channel the darkness or harness the light in battle. The ‘Rule the Galaxy Story Pack’ giveaway codes will be delivered via notification within the GeForce Experience client on December 13, 2017 and must be redeemed at www.swtor.com/redeem-code by December 31, 2017 11:59PM PST / January 1, 2018 @ 7:59PM GMT. The mount and armor set are delivered via in-game mail and the Knights of the Eternal Throne story expansion and Outlander Character Token are granted immediately to your account upon code redemption. You will need to log-in or create a SWTOR account in order to redeem. Stay connected through our Community Blog, Facebook, Twitter, YouTube, Instagram, and Twitch! ^ *PARTICIPATING TERRITORIES INCLUDE: USA, CANADA, UNITED KINGDOM, GERMANY, NORWAY, NETHERLANDS, DENMARK, AUSTRALIA, SINGAPORE, PHILIPPINES, THAILAND, TAIWAN, BRAZIL, MEXICO, ARGENTINA, CHILE, PERU, COLOMBIA. ^ ** THIS IS A PROMOTIONAL OFFER ONLY. REQUIRES AN ACTIVE ACCOUNT FOR Star Wars: THE OLD REPUBLIC. SINGLE-USE CODE EXPIRES DECEMBER 31, 2017 AT 11:59PM PST / JANUARY 1, 2018 AT 7:59AM GMT.